The reality is the use of hard drives to store confidential information is more prominent now more than ever. Businesses cannot afford to overlook protecting the information of their clients, employees, and intellectual property once the use of a hard drive has reached the end of its data lifecycle, especially considering how readily available the information can be on any one drive. The shredding of hard drives prevents data thieves from accessing any data, and is the foolproof way the data is unrecoverable. Don’t let your business fall prey to one of these 7 myths about hard drive destruction. While we all strive to protect the environment, and make sure we are doing our part for future generations, simply recycling your hard drives is no guarantee that the information contained on them is destroyed and inaccessible. 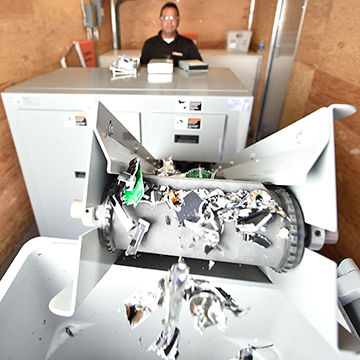 You will want to make sure you use a professional hard drive destruction service that provides both on-site and off-site hard drive shredding (depending on your business needs) and provides you with a document of hard drive destruction so that you know your hard drives have been disposed of securely. Deleting the files on a hard drive will make you feel safe that information on the drive is no longer accessible. However, programs exist that data thieves can use to extract that information even though it has been deleted. In the early days of personal computing, magnets affected the ability to read what information was contained on a hard drive. Today, hard drives are built differently, and are far more resistant to magnets than ever before. While we always recommend that your business have a hard drive destruction policy, many businesses do not. This leads to simply storing the drives in a closet or area where free space is available. It doesn’t take much to realize that doing so puts your business at extreme risk. Just like documents, businesses should have a retention policy on how long to keep hard drives. This may be one of the biggest myths when it comes to hard drive destruction. While it may seem that only large corporate businesses are a target for data thieves (because they make the headlines daily), the majority of data theft affects small business owners. According to the Verizon Data Breach Investigation Report, in 2017 61% of breaches hit small businesses, which is a spike upwards from 53% the previous year. Formatting a hard drive is similar to erasing a hard drive in that, despite the drive being wiped clean, software exists that data thieves can utilize to extract information. This can be anything ranging from credit card numbers to email addresses, depending on what was stored on the drive. There are many ways to damage a hard drive; hitting it with a hammer, running it over with a car, dropping it from a very tall building, or even dropping a bowling ball on it repeatedly. Just know, as foolproof as these all may seem, there are ways to repair that same drive. Putting a few dents in the drive is not going to deter data thieves from trying to access the valuable information contained within. Certified hard drive destruction is the simple answer to alleviate the risks and concern that valuable data is accessible on old drives. Working with a full-service records management company and making sure the retention policy of your hard drives and documents is aligned with reducing risk and maintaining compliance is a must. For more information contact a certified shredding specialist at Williams to answer all your questions. Call 888.920.4549 or visit www.williamsdatamanagement.com.